Hello! The date has finally come and thus I am proud to introduce Samhain Moon! A blog about design, musings, and general passions in the life of a quirky girl. A formal introduction to who I am is soon to follow, but for now stay with me as I figure out prospects for the upcoming year. Comments are welcome and feedback e-mails are encouraged and appreciated. 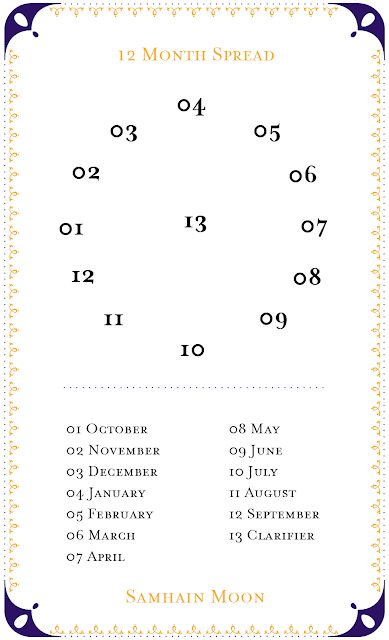 Sometimes one year represents a cycle, other times a year contains a number of cycles within. For me, a year usually contains 3 cycles, working almost in season and meshing together the very last two seasons of the year: Spring, Summer, Autumn-Winter. My year actually resets in the Summer, which marks a temporary death for me. Needless to say, I live my life fully before and after this period of ‘rebirth’. The 12 Month Spread draws a card per month to give you a general sense of the changes that could take place each month. The 13th card, or Clarifier, gives insight on the theme of the year and sheds clarity over any card whose meaning is confusing. It is possible to double the number from 12 to 24 to give more depth to each month. 01. November: Justice. Do whatever is necessary to balance things; like it or not. 02. December: Wheel of Fortune. Change that just happens and brings with it evolution. 03. January: VII of Cups. So many choices, but not all are as good as they look. 04. February: Page of Pentacles. A lucky message. Being too serious and sober for my age. 05. March: Knight of Cups. A boy, dreamy and sensitive, moody and isolated. 06. April: Queen of Swords. Aloof, cold and detached Queen. 07. May: IV of Pentacles. Refusal to move, stuck in a funk. Afraid to lose, lock ups. 08. June: II of Swords. Indecision or temporary truce. Forces to accept, no choice. 09. July: VIII of Swords. Damned if I do, damned if I don’t. It’ll happen anyway. 10. August: VII of Swords. When I finally do move, I will find that someone has stolen something from me. 11. September: III of Swords. Pain and heartbreak. Once I find out about this, I’ll know to move on. 12. October: IX of Swords. Overwhelmed with problems. 13. 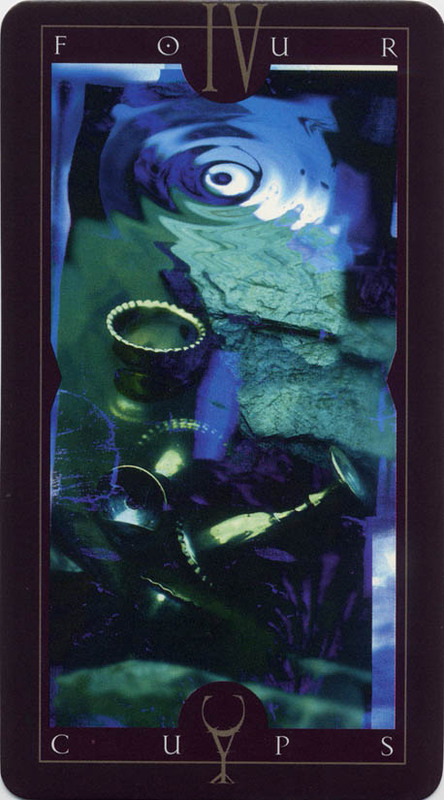 Clarifier: IV of Cups. Emotional stagnation. When I’m bored and unhappy I might be tempted to try things that won’t help me. It all starts with me trying to do the right thing and getting stuck with my choices. The 13th card warns me not to do impulsive things when I get bored with the situation. I may meet someone new and not be ready for it, shutting myself to anything, being afraid to move. When I finally move, it seems I may be too late or I may find out a rude awakening that leads to a lot of stress. The plan is to move slowly, stray from being impulsive. Remember that if it seems too good to be true, it probably is. Chill out and don’t take anything too seriously for your own good. Let’s see how it goes… I will report back in April. 01. Who is Samhain Moon? — Leelahel on Sunday, October 31, 2010 0 ♡ Comment! Personal info. Miscellaneous stuff about my life. — Leelahel on Monday, August 23, 2010 0 ♡ Comment! I have revisited the mission for this blog several times, but the good part is that I have kept it essentially the same. I want to document my journey with the tarot, and I also want to keep track of my own progress in life. I have been reading tarot for nine years. For years now I have had to return to my early journals to compare thoughts with present-day entries. I have found juxtapositions that match up and disagree with each other in the most erratic of patterns, but I always end up learning a lot about myself. Everything seems to be in order now, I just need to start generating content.. However, the official inauguration of this blog will be on October 31, 2010. Special month, special date! To think I will be turning 22 soon! I will be using Dave McKean's Vertigo Tarot, which I am immensely fond of. That's all for now! — Leelahel on Friday, August 06, 2010 0 ♡ Comment!